Recently I’ve been researching my Stark relatives, who immigrated to Darien, Fairfield County, Connecticut, from County Limerick, Ireland, in about 1850. 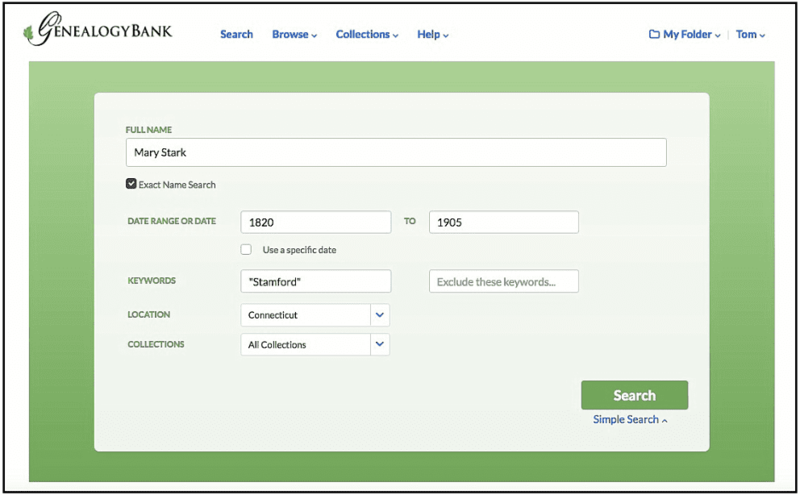 I’ve written about my great-great-uncles Henry and Andrew Stark, but today I decided to search GenealogyBank for their sister Mary Stark (1822-1903), my great-great-aunt. Women are sometimes more difficult to find information on because their surnames often change upon marriage, so it can be hard to know which last name to search for. In Mary’s case, no spouse was listed on her FamilySearch record, so I was hopeful that I would be able to find information about her. I know from my notes that Mary died in Stamford, Fairfield County, Connecticut, in 1903, so I used “Stamford” as a keyword when I searched for her name. In this initial search, I was hoping to locate an obituary for Mary, and I kept the date range pretty close to her lifespan. Bingo – the first search result is the obituary I was looking for. I also like to learn a bit about what my relatives’ hometowns looked like when they lived there – this gives me more context for their lives and experiences. At the time of Mary’s death, Stamford, Connecticut, had a population of about 19,000 people, according to a Wikipedia article on the city. Wow – could it really have been that small? The obituary mentions that Mary lived on the East Side of town. Searching, I quickly found an old postcard of her part of town, showing the old William Street School just a block from her home. 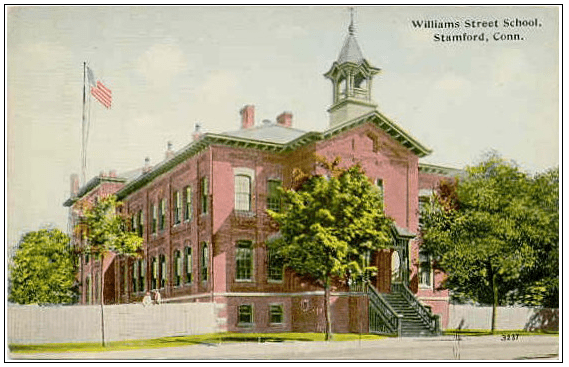 Photo: William Street School, Stamford, Connecticut. Source: Danziger & Berman; Wikimedia Commons. Another old postcard, this one of Stamford’s downtown in about 1908, shows what Stamford looked like when Mary lived there. Photo: Atlantic Square, Stamford, Connecticut. Source: Wikimedia Commons. 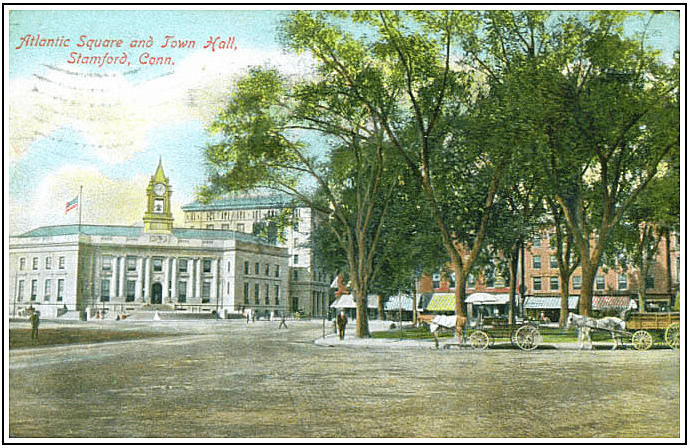 The “Old Town Hall” – horse-drawn wagons – it was a quieter time in Stamford, Connecticut. Genealogy Tip: Using old newspaper articles such as obituaries, and photographs like those found in old postcards, can be a great way to get a clearer picture of who your ancestors were and what their lives were like. Find and document your family stories – write them down and preserve them online. This is the first article I have read from GenealogyBank. The post cards are beautiful and it’s a great suggestion to use them to help get a better idea of life in the time of our ancestors. Thanks for that. How are you preserving your family history? Are you putting it online? Where? Use the technique of harvesting copyright free images – like these postcards from Wikipedia to add a visual to your family stories. Tell us how you use this and other approaches to make reading your family history memorable and fun. Are you positive you have the right person? What other facts do you have? A death certificate? She’s listed in 1903 as Mrs. If she married a man named Stark then all is well. If she didn’t marry a man named Stark then there are questions. She would not be the first person who had the same name at the same time in the same location. By 1903 single women were not being given the Mrs. designation out of respect. Before I would accept this as the Mary Stark I was looking for I would need a lot more evidence. I hadn’t noticed that the newspaper styled her “Mrs.” … she never married. Very interesting find Toni – I am going to keep thinking about this one. Many thanks for reaching out and sharing your findings. My father wrote a life memoir for me. A year before he died, I transcribed it and annotated it, identifying people he mentioned, places he worked at, and places that he and my mother had lived when he was in the Navy during WW II. I found that one of the best sources of pictures contemporary to their life were postcards. I found a ’40s postcard of the hotel they stayed in for their 2-day honeymoon, a ’30 postcard of the Chicago downtown Montgomery Ward building where he met my Mom when she was hired for him to train to take his place when he enlisted in 1942, and the Bismarck Inn on LaSalle St., where they had dinner in 1943 and had a photo taken at their table. A simple Google search of the name of the place and Ebay are great places to start your search for postcard views. I am glad that your Dad wrote his life story for you – and that you have preserved it – annotated it and added illustrations so that their history will be even more interesting and meaningful for the rising generation. By explaining the connections that might be self evident to you and I – will make it that much easier for the next generation to understand what happened, when and why. Let me also suggest Wikipedia – it is a terrific source for copyright free images that we all can use to illustrate our family history. Now – have you put this family history online? If not – are you planning to? How do you plan to make sure his history and your annotations are available in the years to come? I was lucky enough to receive a copy of a picture that contains “Aunt Nell” who was referred to in another picture sent to my father while he was in the war. Still do not know her last name. Might just have to search the name Nell in newspapers.com since they seem to have a lot of articles from the town my father grew up in. I have found there are many relatives that the family just never talked about. I wonder why??? I’ve collected about 300 newspaper clippings on my great grandfather. I’m currently attempting to stitch them altogether in a story of his life and times. Some of these clippings came from using genealogybank, but most of them have come the old fashioned way, searching through miles of microfilm. I’ve also searched the web for pictures of the towns where he lived, and have found some for each of the towns and cities. What a great article. The first one that I have read. It gives me inspiration as I struggle to find any of my family beyond the great grandparents on the paternal side and grandparents on the maternal side. They lived in East Berlin and West Berlin. Beyond that I have nothing to go on. Wikipedia is a great suggestion that I didn’t even consider. Looking forward to more discovery! Please let us know what you discover about your family. Be sure to document and keep your family history on one of the key online family tree sites – like FamilySearch – so that their stories will be easily findable by the family for generations to come.